Week in review for period of August 13, 2010 to August 19, 2010. For this seven day report period, energy prices fell for third straight week. The 12 month average price for natural gas at the well-head fell 3%, and the average 12 month price for peak power on the PJM fell 2%. 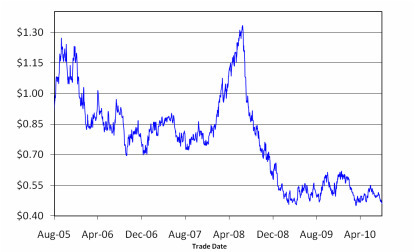 Since July 29, 2010 natural gas prices have fallen 9% and electricity prices have fallen 5.5%. Crude oil has dropped 10% in the last two weeks. During this past June and July, the hot summer temperatures kept upward pressure on energy prices as gas was diverted from the storage fields to the electric generation plants. However, too many other factors have recently surfaced and are now placing downward pressure on energy prices. The recent price decreases are related to the lack of hurricane activity in the Gulf, a sluggish economy and the robust natural gas supplies that are now coming from the newly discovered shale piles in Pennsylvania. 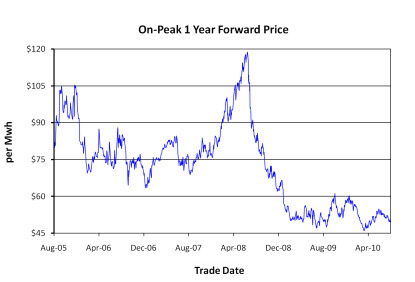 Even though the recent trend lines for energy prices are down, energy prices are still trading within a reasonably tight band as you can see from the graphs below. The wrestling match is not over. Storage Update: This week’s injection was 27 Bcf. The injection was below the 5 year avg. injection of 50 Bcf and below last year’s injection of 54 Bcf. We are 5.8% below last year’s levels. As summer temperatures drop, less gas will be burned for electric generation and more gas will go into storage. Luckily we are 7.0% above the 5 year average. Weekly Drilling Rig Update: Active rig count released by Baker and Hughes for week ending 8/13/10 was 992 rigs which was a net increase of 9 rigs. The rig count is 304 higher than the rig count reported this same week last year. However, we are 21% below the 5 year average rig count of 1,257.